The Montbell Dynamo Wind Parka is an incredibly small and compact wind shell which will shed snow, wind and light precipitation to keep you warm and dry on ridge tops and when the weather get nasty. The nylon shell is made up of 12 and 40 denier rip-stop fabric which is semi-translucent and provides some stretch for the skin up or the ski down. 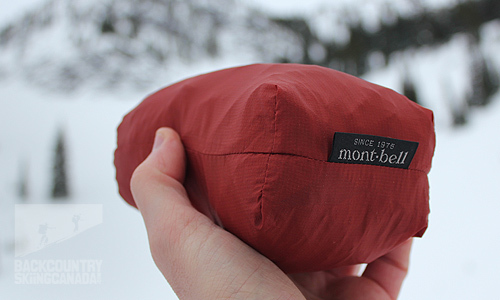 Montbell uses what they can "Ballistic Airlight Nylon" which provides good durability and increased stretch thanks to the "bias stretch" that has been woven into the fabric. 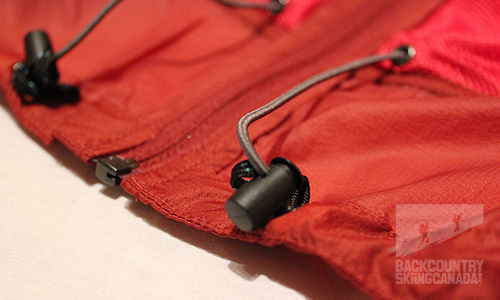 This is essentially a false twist applied to the individual threads to give the Montbell Dynamo Wind Parka some inherent elastic qualities in the direction you require them. On top of this a Polkatex DWR finish which is rated for 100 washes while still maintaining 90% of its water repellency has been added to the fabric to increase water repellency over the long term. The more than generous cut of the Montbell Dynamo Wind Parka allows you to layer over existing cloths or jackets to keep the heat in. 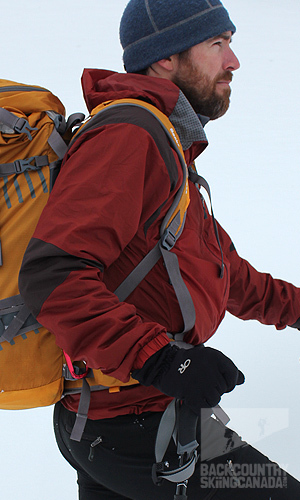 You can also throw it on over a base layer when you near the summit to cut the wind. 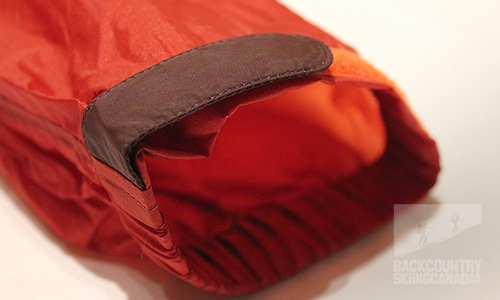 Weighing in at just 144 grams and about the size of a few energy bars this is one jacket that you don't have to think about tossing in your pack. Draw cords on the waist and elasticized cuffs are nice details that will keep the snow out should you decide to forego the hard shell and just ski down in the Montbell Dynamo Wind Parka. 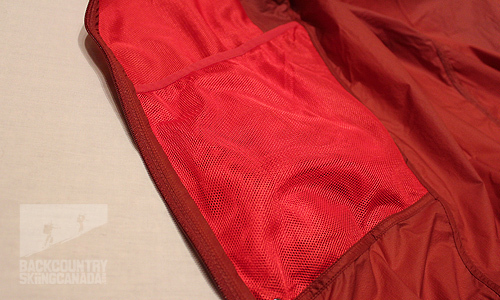 The two hand pockets are mesh lined to allow you to vent heat as it builds up and there are two stash pockets on the inside to store items on the go, these are not secured however so items may go missing from these if you are not mindful. With size and weight on it's side while not reducing many required features the folks at Montbell have aptly named this jacket the "Dynamo" Wind Parka, read on to see why this is justified. 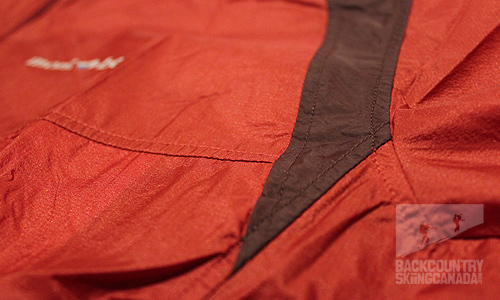 I have seen quite a few new wind jackets come out over the past season and so I was understandably intrigued to try one out and see how it would fit into my backcountry skiing layering system. 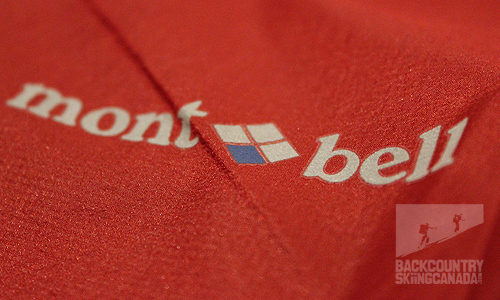 I tried the Montbell Dynamo Wind Parka in several conditions to see where its strengths lie and found that it excelled at cutting the wind which one would imagine given its name. This was not a jacket that I could wear while skinning up as I found the fabric did not breath as well as I had hoped so I quickly became, for the lack of a better word - moist. I must admit though that this was on days where the mercury was not more than a few degrees below zero. On super cold days this is a different story as the ambient air temp cooled me before I was able to perspire and I was very comfortable overall with very little between me and the elements. I found that I would often switch over and ski down in the Montbell Dynamo Wind Park to save time as it provided enough warmth and protection if I happened to host a yard sale. 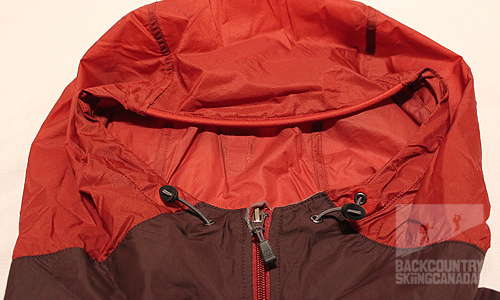 So how did the Montbell Dynamo Wind Parka fit into my jacket laying system? Well, it replaced a much heavier and bulkier soft shell jacket that took up far too much space in my pack. As it seemed to spend the majority of the time in my pack, I was not sad to see it go and welcomed the additional space and weight savings. The Montbell Dynamo Wind Parka takes up no space and is there when you need even if this is only occasionally. It is so light and compact that there is no reason not to carry it. The included stuff sac is more than enough to contain the jacket however it does little to compress it's size down even further. 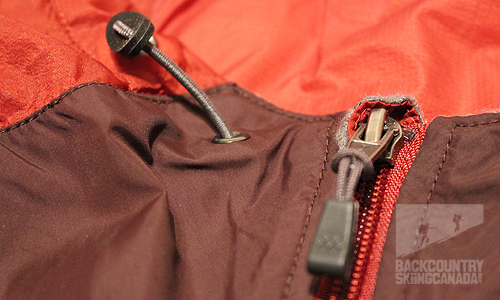 I am a big fan of included stuff sacs but the Montbell Dynamo Wind Parka only has two secured pockets and no place to really store the stuff sac with out getting in the way, this is just a recipe for loosing the stuff sack. I would like to see a double zipper on one of the hand warmer pockets and thus eliminating the need for the stuff sack all together. While the Mont-bell Dynamo Wind Parka may not replace one of your breathable insulation layers in your kit it may replace a duplicate layer or just become a handy addition to what you currently use in your layering system or a dependable emergency layer. 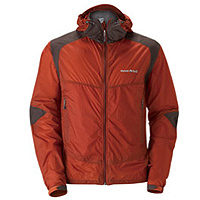 Incredibly light and compact jacket that sheds snow and rain and breaks the bite of the wind. The "Bias Stretch" fabric really works and is not just another marketing spin. A great everyday piece or one for emergencies. Nylon fabric does not move a lot of moisture so this is not a warm weather jacket when you are trudging up a skin track. Stuff sac has no place to go it when the jacket is in use - an additional interior pocket would be good, or a simple self stuffing pocket?